We decided to base infantry by company one of the reasons being that this is used by our preferred ruleset General de Brigade. 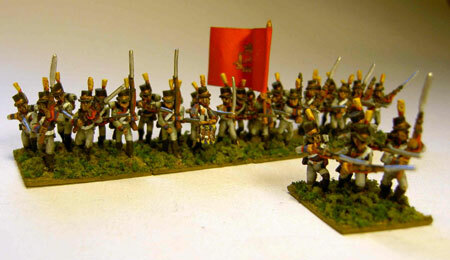 The size of the line infantry stand is six figures on a 3×2,5 centimetres. Stands for jaegers are slightly smaller with four figures so that skirmishing units can be deployed with wider frontage and are a bit more flexible. The different sized stand also makes distinguishing jaegers an easier task. Each line infantry battalion’s jaeger platoon uses these smaller stands as well. So each line infantry battalion consists of four line companies/stands and one jaeger platoon. Some regiments had their battalions divided into half battalions of two companies. A half battalion has 2 stands and there’s one jaeger platoon per two half battalions. As the number of soldiers in each battalion varied we decided that the stands need not always contain the same number of figures. 4 figures were attached to the line infantry jaeger platoon stand and then the remaining figures were divided with the number of companies (almost always 4). If this was not an even number we checked if it could be make made even by removing a figure from the jaeger platoon. If this didn’t help it was no biggie. Even though it is preferable that the companies have the same number of figures it certainly isn’t the end of the world. In most cases you have either 5 or 6 figures in a company but in some cases as few as 4. In a couple instances the Finns also ended up having 7 figures in one of the batallion’s companies which just meant that we had to squeeze the figures to the regular sized company base instead of a larger one. Jaeger battalions have 8 stands and they should have 4 figures and when unable to do so 3. In the case of jaeger half battalions have four stands. We used cardboardof approximately 1 millimetre thickness for bases. Plastic is also very suitable, but feel free to use whichever material and thickness you prefer. Start off by undercoating one side of the cardboard sheet with black. Then draw the stands to the other side of it with the help of ruler and cut with scissors or hobby knife. Paint all edges of the cardboard with suitable color like resonably dark earth brown. You now might want to write the unit’s name to the bottom (unpainted) side of the base to help recognition in the future. Attach the figures to the stands preferably using white glue and let the glue cure. You can add some more variety to the stands by gluing small stones to them. While the glue is setting take some Woodland Scenics Brushes or Underbrush clumps preferably of a couple different colors and start mincing these into as small bits as possible with a pair of scissors. This menial and somewhat time consuming chore can easily be done while watching TV. This product will be used as flock to represent abundant undergrowth found in Finland such as heather etc. Pour some white glue to a small container like a cap of a soda bottle. Tint the glue with acrylic paint of a very dark shade like, erm, black. Add a little water to the mixture to make it flow somewhat better. Using an old brush paint the stands including the bases of the actual figures with the glue/paint mixture and dip into a box filled with Woodland Scenic’s Fine Turf, preferably Earth Blend (T50). After this is dry repeat the process with the stuff you minced earlier on but now you don’t necessarily need to cover each and every part of the stand with the material. As the minced clumps will still be so big that they might get stuck between the figures it is a god idea to have s thin stick like a toothpick at hand which you can use to press the clumps against the glued base. Note that if you skip the initial flocking with Fine Turf plenty of the cardboard will end up showing beneath and between the clumps of the minced stuff and the end result won’t look that good. Also you can flock the cardboard bases with the Turf prior to attaching the figures and then just patch the figure bases when tese have been glued to the base. After the final coat of flock has cured turn each stand upside down and gently tap the bottom to remove the excess material. If some of the minced material is still between the figures or the legs remove the excess with a brush. Now it is a good time to attach the flags to the flagpoles. Finally give the stands a coat of varnish to help the flocking material better adhere to the stands. Another coat of varnish will also be good for the figures.